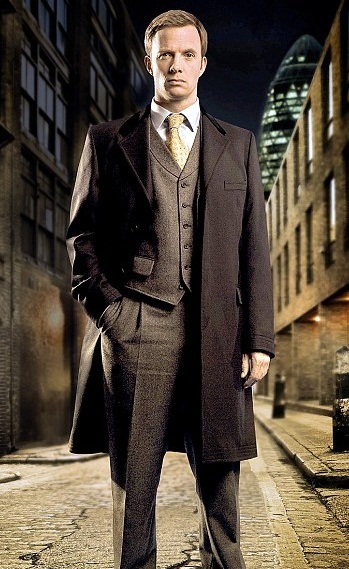 Rupert Penry-Jones as DI Chandler in Whitechapel here looks quite the epitome of class. I know it helps that he has perfect figure that we all wish we had, but no matter what your shape, with the help of a good tailor, you can also create a look that earns you the title of best dressed man in your office. What I really wanted to show you here is the coat. It's no ordinary topcoat (not to be confused with an overcoat which is made of a heavier cloth and tends to end below the knee. This type of coat is known as a Covert Coat pronounced Cu-Vat. But what makes a Covert coat, a Covert coat? The fly front - When done up, the buttons don't show to the outside. The flap pockets like you see on regular jacket. The outside ticket pocket above right flap (unfortunately you can't quite see it in this picture). The rows of machine topstitching on cuffs and hem - 4 rows traditionally. The topstitching 3/8" in from the edges of lapels, front edge and pocket flaps. The just above knee length. And the last, which I think really makes the coat work, is the velvet top-collar. Whilst not all covert coats have to have a velvet top-collar, I personally think they all should. Have it to match for subtlety, or for a more striking look, how about a maroon or emerald green? This type of coat works especially well for shorter men as the length and balance of the design is flattering.